In a joint China-France-Japan collaboration, we have imaged sound waves on a tiny membrane, showing that at certain frequencies one can track in two dimensions a wave that is frozen in place, a so-called zero-group-velocity wave. 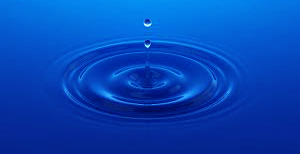 If a stone is thrown into a pond, an expanding ring of ripples, called the wave group, appears, which travels outwards. But what if you threw a stone in and the water just vibrated within a confined region, never spreading out? Obviously this would be impossible. It would be very surprising if water waves did not spread out! But for ripples on a slab of material this is just the norm. If you happen to choose the frequency right, you can can excite a localized packet of waves that never spreads out. This has been known for more than 100 years since the physicist Horace Lamb in 1917 first predicted this effect, but such waves have never been imaged in two dimensions. In a metal-coated 3 mm square membrane of silicon nitride only 2/1000 mm thick, we have imaged zero-group-velocity ripples using an ultrafast laser technique with finely-tuned sound-frequency control in the gigahertz (1000,000,000 cycles/second) range. As predicted by Lamb, the ripples wobble up and down but never spread out. We show that Lamb's theory applies, just as expected, to our observations. You can watch these frozen waves in the right-hand movie below. The left-hand movie shows normal waves. Experimental movies of ripples on a 50-micron square region of the membrane. Left: normal waves that travel outwards. Right: zero-group velocity waves that are frozen in space. Imaging such waves is expected to provide new avenues for evaluating and quantifying the mechanical integrity of nanostructures. 'Imaging gigahertz zero-group-velocity Lamb waves' Q. Xie et al., Nat. Commun. (in press)..